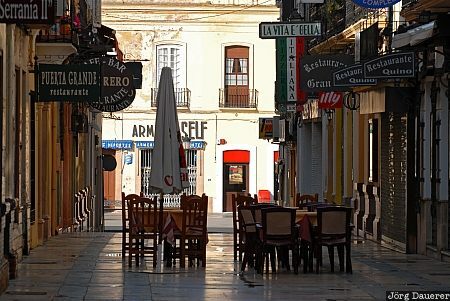 Desks and chairs of a restaurant in a narrow alley in Ronda. I took his image on an early Sunday morning when I was still almost alone on the streets of Ronda. Thus it was possible to come up with this very clean and simple uncluttered image. Ronda is in the western part of Andalusia in southern Spain. This photo was taken in the morning of a sunny day in April of 2008. This photo was the image of the month in February of 2011. This photo was taken with a digital camera.